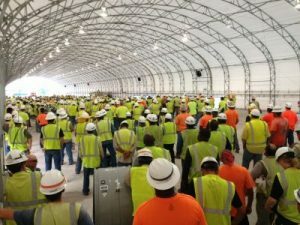 Oil and gas companies that need a facility for their employees to have lunch or to host safety meetings rely on Big Top to provide a solution. Our fabric structures are a cost-effective alternative to traditional buildings, in that they cost less to assemble and do not require the expertise of a professional construction crew. They also help to reduce energy costs due to the translucent fabric roof, which allows in plenty of natural light to illuminate the interior without the need for electric lighting. Another added benefit is that you can keep your employees onsite rather than having to travel off site for lunch. By providing a safe infrastructure for your team to gather onsite you increase production by limiting downtime. Big Top’s tensile structures will provide shelter from rain, snow, and wind. The galvanized steel frame is durable enough to withstand nearly any type of weather, and we can also engineer the building for heavy snow and wind loads if needed. We can also include lightning protection in your design, which will allow you to use the facility as a muster station in the event that your crew needs a safe space to ride out a thunderstorm. Even when the weather is pleasant, your employees will be safe from sun exposure as they enjoy their lunch or listen to a safety meeting. That’s because the fabric roof blocks 99.95 percent of UV-A and UV-B radiation, which also allows it to maintain a comfortable interior temperature that is 15 degrees cooler in the summer and warmer in the winter than the temperature outside. To fully meet the needs of your lunchroom or safety meeting facility, we can include a range of optional accessories. These can include an HVAC system and insulation, doors, flooring, lunch tables, seating, and a system for artificial lighting. You can also customize the size of your facility due to the modular design of our tensile structures, which allows them to be built to virtually any size. Learn more about how oil and gas companies use our fabric structures as lunchrooms and safety meeting facilities by contacting Big Top today.